I'm back!! 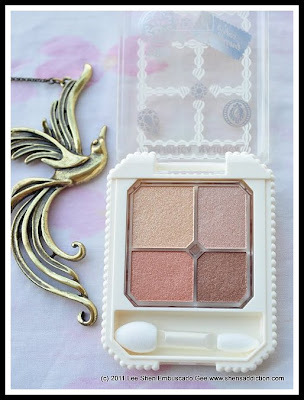 With yet another tutorial using this cute palette from Majolica Majorca called Carmelise. It's a very simply look, really. Going from dark to light shades of the palette. 1. Apply eyeshadow no. 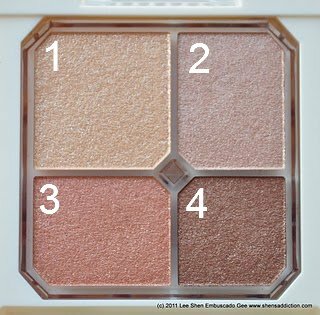 4 all over your inner lid. 3. Highlight your brow bone with eyeshadow no. 2 to give your eyes a bit of lift. 4. Define eyes with Majolica Majorca Perfect Automatic Liner. 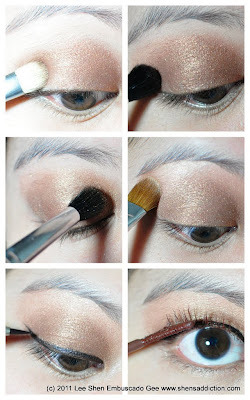 Give your peepers a bit of attitude and add a wing tip at the end. 5. Brighten up your eyes and accentuate your lashes with Majolica Majorca Lash Expander Frame Plus Mascara. Make it more natural by using the brown mascara variant. Nice look Shen! Very happy looking! Your eyeliner is soooo perfect! A lovely look! wow your make up is flawless in these pictures!